If the fireplace in your house is no longer functional, it can still be used to define and add to a room. With a few simple touches, a faux fireplace can give the illusion of a functioning hearth and provide the room with charm and warmth. Use home decor items and natural resources such as logs, mirrors, and Christmas lights to dress up your faux fireplace. Put a mirror in your faux fireplace. Chop wood logs or buy them from a local home goods store. Then stack them one on top of the other in the fireplace. Start by laying the logs across the base of the fireplace and work your way upwards by layering the logs. This fireplace decoration option is charming and still gives the impression of warmth and functionality without burning wood. Create the cozy feel of a burning hearth without the ashes and danger of a real fire. Buy about 10 logs of firewood (or chop it yourself) and a string of triple-coated ceramic Christmas light bulbs. Stack the logs in or in front of the fireplace as you would for a functioning fireplace. Wrap the Christmas tree lights around the logs randomly. Plug in the lights to get what Time Out Chicago calls a "real-life flickering fire—a cozy and happy little gathering spot that guests ooh and ahh over." Measure the height and width of your faux fireplace hearth and have a mirror custom cut to fit your dimensions. Place the mirror inside the fireplace. You may want to attach it to the back of the fireplace with mirror glue. Arrange candles of varying heights and widths in front of the mirror and on the base of the fireplace. 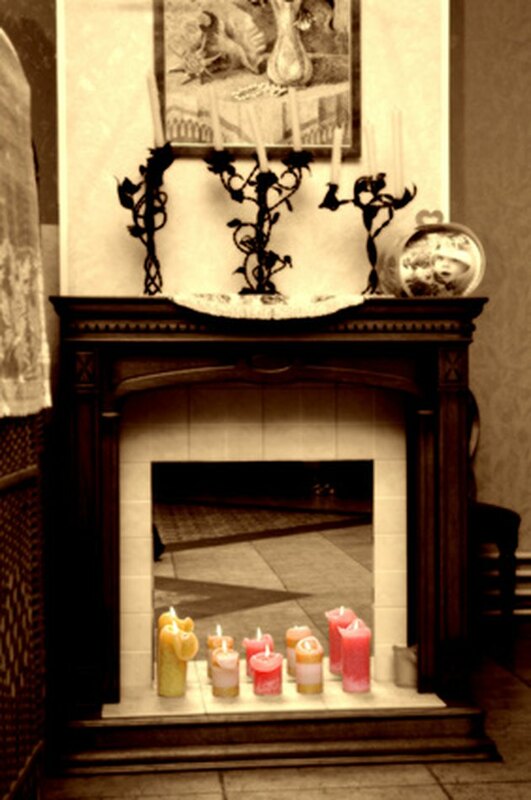 You also can use glass votives and various stacked candle holders to create a romantic feel in the hearth.